I wake up every morning and one of the first thoughts that goes through my head is “what am I going to have for dinner tonight?”. On grey dreary mornings where I hear the rain pounding on the roof, that thought gets modified to, “what am I going to have for dinner tonight that will warm my soul?”. 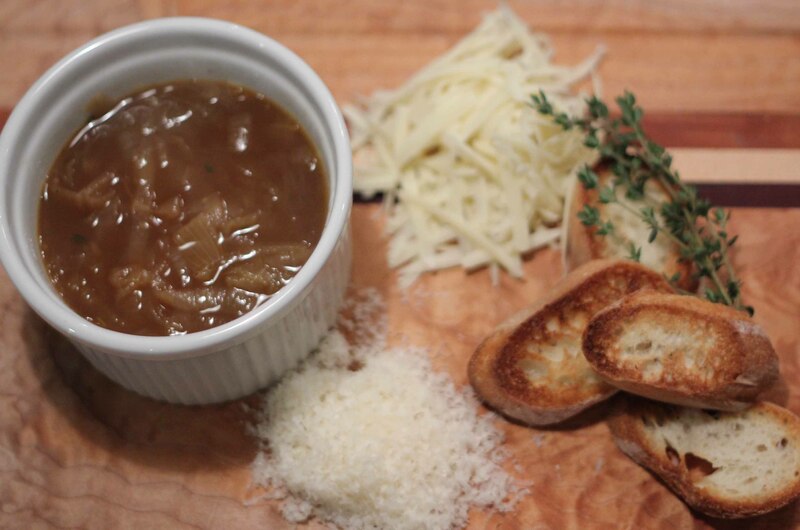 This past Monday morning was one of those mornings and knowing that I had all day to put into my answer, I easily decided on French Onion Soup. It took me over an hour of looking through my cookbooks to remember which my go-to recipe was. I guess that’s the good thing about having this blog, I won’t ever have to question again whether or not it was Jamie Oliver, Rob Feenie or the Barefoot Contessa. It was none of those, but a recipe found on a heavily stained page in an old Martha Stewart cookbook. I should forewarn you that this recipe. It is neither fast nor cheap. I realized as I wandered around Granville Island picking up my ingredients that it would be cheaper for me to go to Bistro Pastis and have a French Onion Soup, Beef Tartare and Fries with a glass of Kir Royale in cost, time and effort. And if I wasn’t able to bank on the results of my homemade version, I may have been convinced to do just that. But I know how my version tastes and it’s pretty darn good. Heres how the magic starts. You have to be patient to let the heat do its thing. Hours later, with no deviation from the recipe (except the addition of parmesan cheese), I am ready to assemble the soup. I loaded this with so much cheese and still it looks skimpy on the cheese. It was ooey gooey and warmed my soul. Exactly what I needed! Melt butter in a large Dutch oven or heavy pot on medium-low heat. Add the onions. Spread them out in as thin a layer as possible. 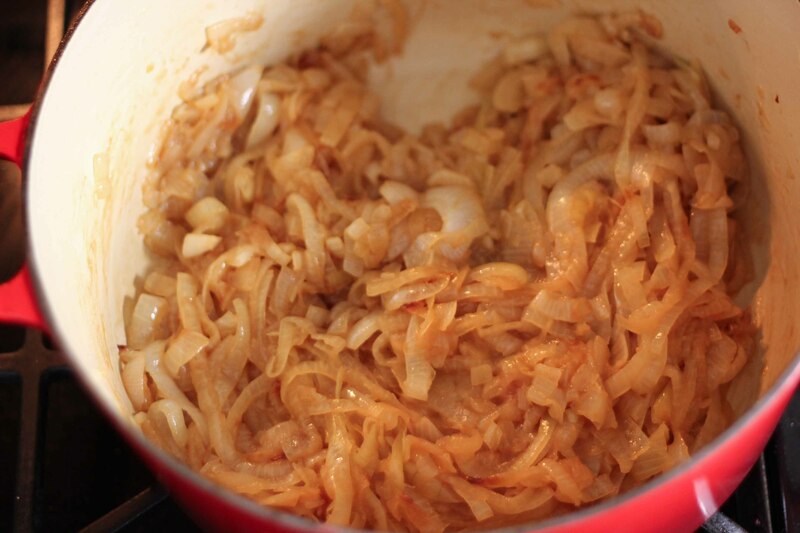 Sprinkle with sugar and cook, stirring just as needed to keep the onions from sticking until they are melting and soft, golden brown and beginning to caramelize, about 1 hour. Resist the urge to stir them too often or they won’t caramelize. Sprinkle the flour over the onions and stir to coat. Add the sherry, stock and thyme and bring to a simmer. Cook, partially covered for about 30 minutes to allow flavours to combine. Season with S&P. Meanwhile lightly toast the bread under a broiler, set aside. Ladle the hot soup into six oven proof bowls. Arrange the bowls on a baking pan. 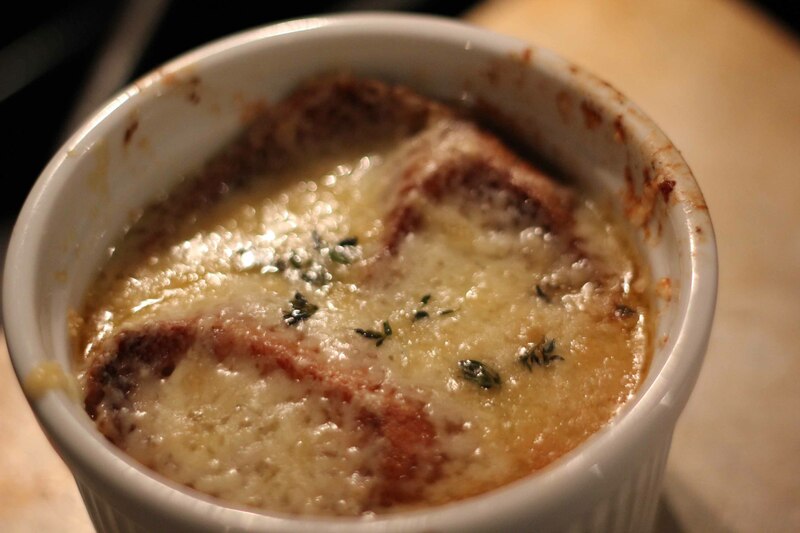 Place 1 or 2 pieces of toasted bread over each bowl of soup. Sprinkle 1/2 cup of grated cheese over the bread and place under the broiler until cheese is melted and crusty-brown around the edges. Watch carefully that the bread doesn’t burn. Serve immediately. But be careful, it’s HOT! So you combined the Parmesan & Gruyere? Or knowing you, you used both?